There’s nothing like roasting hot dogs or marshmallows over a crackling fire as bright specks of ember rise into the night air. A backyard fire pit is the perfect gathering spot for friends and family—a place to enjoy an impromptu cookout, a few drinks, and plenty of conversation. Don’t have a fire pit? No problem. Here’s our ultimate do-it-yourself pit, which you can create in a weekend (actually…start early Saturday and enjoy a fire in the evening!). 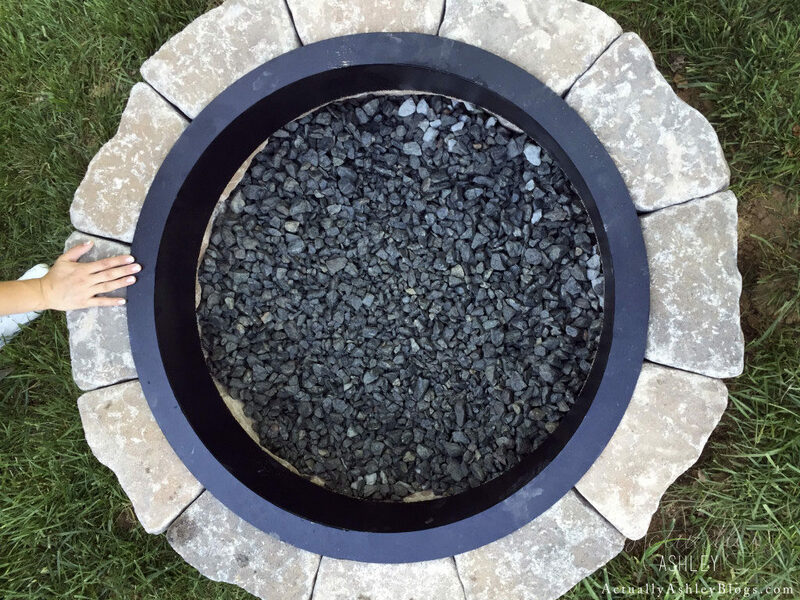 Keep in mind you can scale your fire pit size up or down, and the metal fire-ring insert is completely optional. Make sure you build your fire pit well away from any structures, fences, foliage, and tree branches. Check local ordinances to make sure fires in your yard are permitted. Before you site your fire pit, determine which way the wind generally blows. You won’t want all the smoke blowing onto your neighbor’s property, for example. Don’t use any stones that have been submerged in water, as they can explode in the fire pit’s heat. Keep in mind that concrete blocks may break down from the heat over time, but the beauty of using them is they’re a cinch to replace. Understand that while a metal fire pit liner/insert is not mandatory, it protects the rocks from deterioration and creates a structurally sound core. Keep a level handy at the outset of building to ensure your blocks lie on perfectly flat land. First, find a flat area to site your fire pit, away from anything that can catch on fire (trees, buildings, fences). 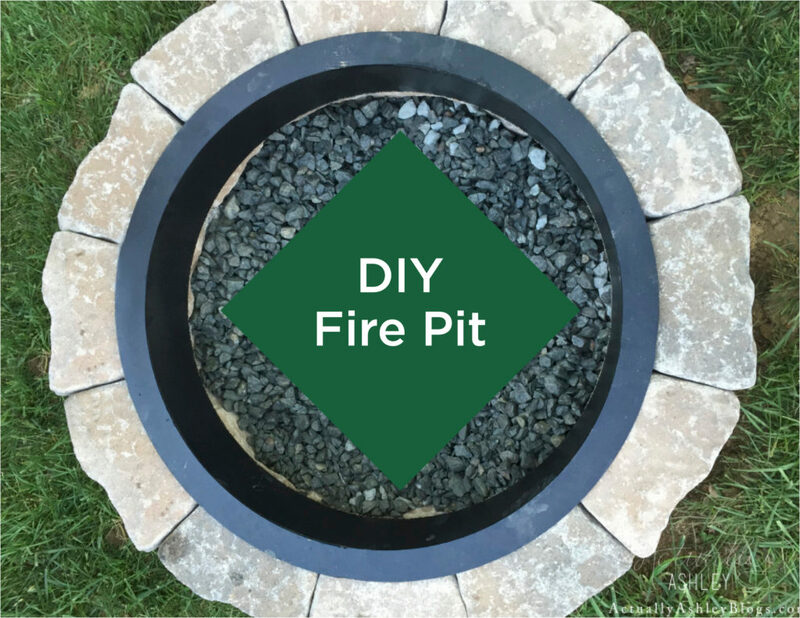 If you’re using a fire pit ring, place it where you’d like the pit and arrange a row of blocks around it to determine the placement and number of stones required for each row. Then, outline the stone/ring circle with marking spray paint so you know where to build. Remove the stones and the fire pit ring for the moment and use your shovel to dig out your circle 12 inches deep. 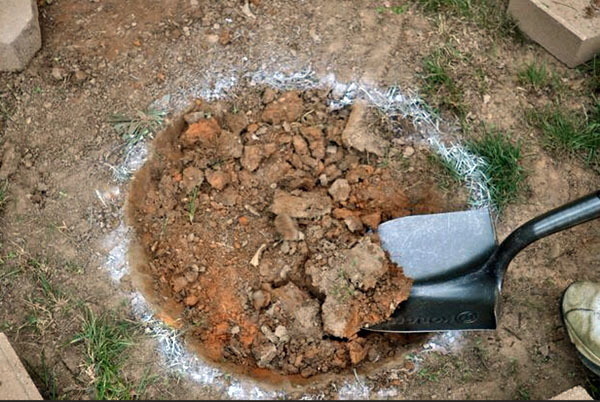 Once the hole is dug, use the level to help you create as flat a space as possible, then fill it with a 4-inch layer of gravel. 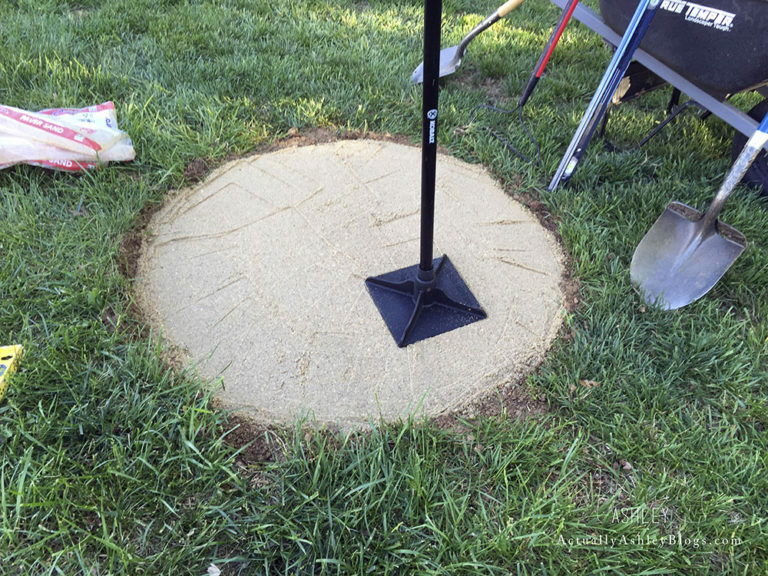 Top your gravel layer with 4 inches of sand, and tamp flat to create a solid base upon which to build your pit. This helps with fire pit drainage. Now begin laying your stone, stacking it in whatever pattern you like. If you’re using a steel ring inside, you may want to set that in the center to make sure you’re placing your stone tightly around it. 1) It’s a pain; 2) for simplicity’s sake; 3) if a rock cracks or breaks, it’ll be easier to swap it out later if you don’t use adhesive. Ashley from Actually Ashley also made a non-permanent fire pit, so they could move it in the future. After stacking about three or four layers, shovel about two or three extra inches of gravel into the pit to create a nice burning surface for your firewood. Continue to stack stone until your pit stands about 1 foot tall, give or take a bit. A good rule of thumb is to make your pit no taller than 18 to 20 inches, otherwise the fire will be too far down to enjoy. 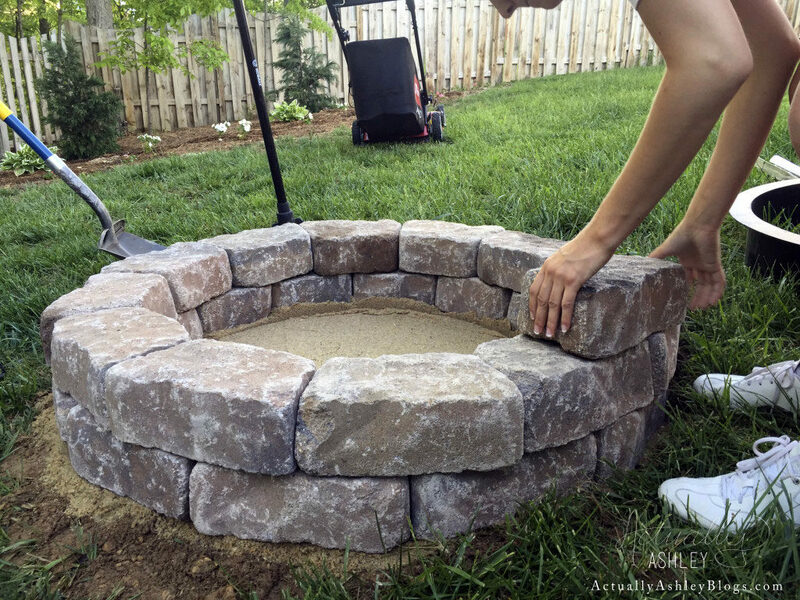 If you’re using the fire pit ring, you may want to stack one layer of stone over the ring’s lip to secure it (not shown below). Don’t forget to add comfortable seating around the fire pit. 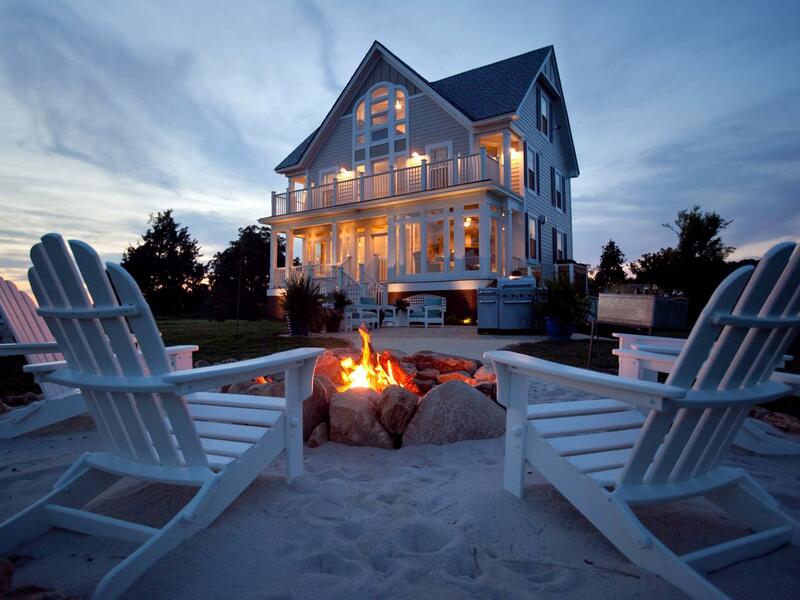 We think a set of Trex® Outdoor Furniture™ Cape Cod Adirondacks is the perfect comfortable seating to place around the fire …. provided you don’t get the chairs too close to the heat. Now that you’ve put plenty of sweat equity into creating your fire pit, relax. The beauty of creating this fixture in your yard is that it’s easy to maintain and creates a long-lasting outdoor activity you, your family, and friends can enjoy. Big thanks to actuallyashleyblogs.com for providing photos for this post. Be sure to check out her full tutorial as well. 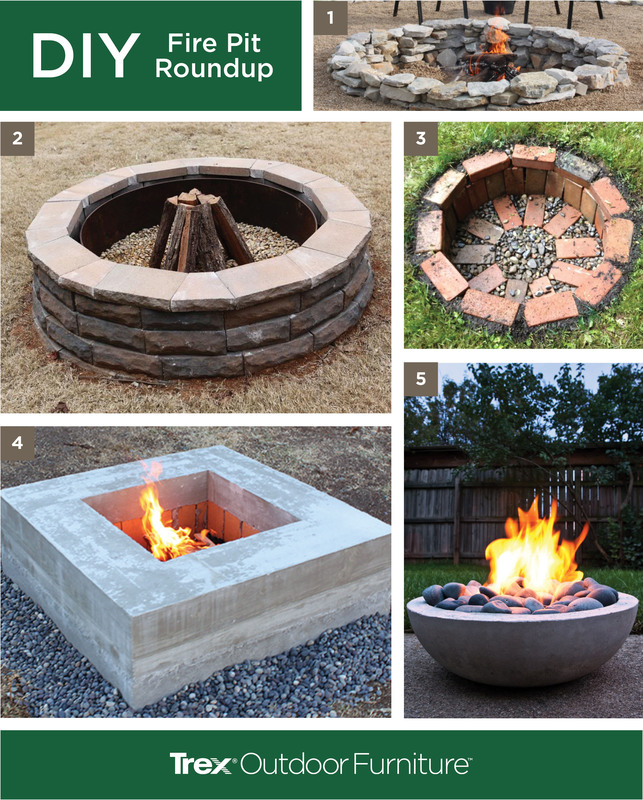 Thank you for featuring our backyard fire pit! It was a super simple weekend project that we enjoy all the time. Now we need a new set of chairs to go with it, I love the Adirondack chairs you feature. We will have to look for some! Very nice Ashley! Did you use fire treated stone? Those look big enough that they may be ok, but be careful for cracking. Another solution is to just insert an already made fire pit inside that would protect the stone. I love this DIY fire pits idea of you, though it’s not new anymore cause a lot of people doing this as well, but still I’m looking forward to do my own fire pits like this.